We got to Madrid and had to walk for what seemed like miles to the airport exit. We took the express airport bus to Atocha station for 2 euros. On the way there the glass of the back door actually shattered. I don’t know if it was because something hit it or because it was so hot outside/ cool inside. The bus driver didn’t stop, though. At Atocha we bought AVE tickets to Cordoba. The train ride took about an hour and forty minutes. From the Cordoba station we took a taxi to our hotel, Hospederia del Atalia, which is in the Jewish Quarter. The hotel is in a residential complex and has a lovely whitewashed patio. The man at the front desk didn’t speak much English. Many people there don’t speak English, so I got to practice my Spanish a lot on this trip. Mom said she couldn’t have gotten along there by herself. Our room had lovely décor, but the hotel had several problems: the AC didn’t work well, there was no computer in the lobby, and there was no ice machine (a problem when we were constantly dehydrated and had only hot water to drink). 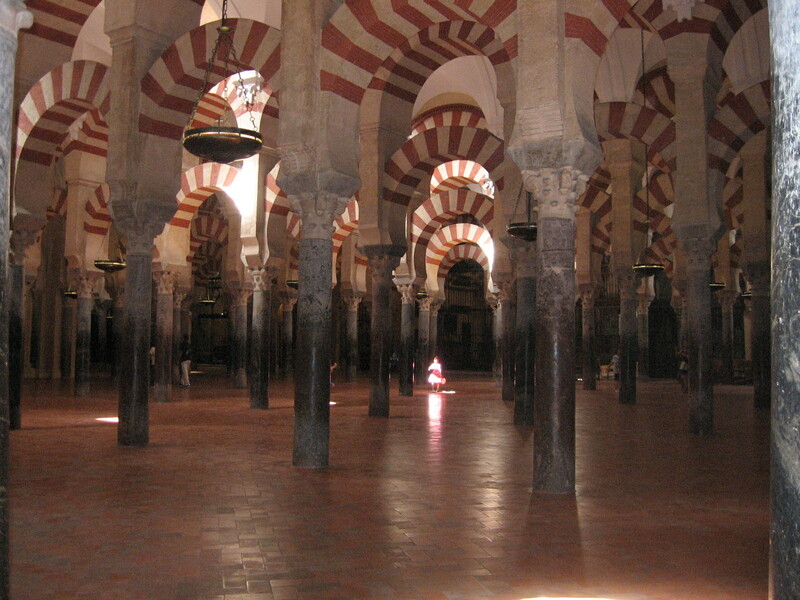 We had to keep going to a hotel around the Mezquita and paying to use their computer. After checking in we walked around a little. The streets around the hotel are extremely touristy and it was very hot (over 100). We walked to the Mezquita and went into the orange grove courtyard. We saw a workshop called Meryan which has beautiful leather goods. Then we went to the most basic restaurant we could find and had a late lunch/ early dinner of pizza and Spanish omelette, which were mediocre. We were too hot and tired to do much else after this so we went back to our hotel and went to sleep. The hotel breakfast cost six euros, so we decided to try our luck outside. The only place that was open sold horrible croissants and sandwiches and coffee in plastic cups. I was also surprised by how most of the locals we encountered (like the cashier) were not friendly at all. After breakfast we went inside the Mezquita, which was free until 10:30 am. They were holding mass inside. 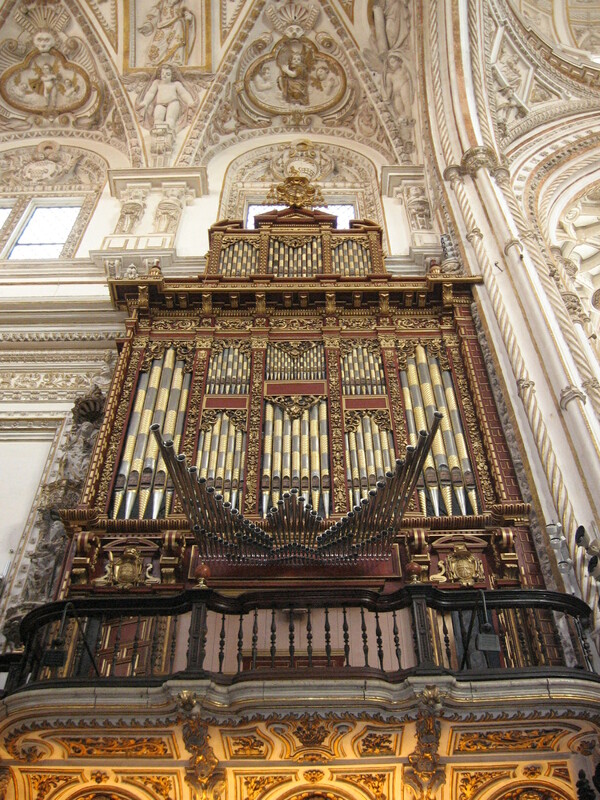 It was very impressive, and I was surprised by the massive Baroque altar and dome in the center of the cathedral. We decided to come back later and get the audio guide. After this we walked over the Roman bridge. I had an umbrella to protect myself from the sun, but it was still pretty intense. Then we went to the Jewish Quarter and saw the synagogue, which is small but fascinating. The decorations reminded me of the Alhambra. Then to the Casa Sefarad, which is interesting but like many other Jewish museums I’ve seen in Europe – without many authentic Jewish artifacts, and what artifacts there are relate to the liturgy. It also had a lot of reading, including a wall-size page of text on Maimonides. There were a lot of other American Jews there. I think then we went to eat lunch in Casa Mazal, which is connected to Casa Sefarad and has Sephardic-style food. We got falafel and an eggplant and rice dish. The food here was the most basic, healthy and natural of anything we had in Cordoba. Next we went to Casa Andalusi, which had some nice things, including a Visigothic mosaic in the basement and a pool covered in flowers, but very little depth or information. I got the book Tales from the Alhambra by Washington Irving there. We bought tickets for a flamenco show that night at the Cardenal, outside the Mezquita. The owner of the place was very nice to us, said he wanted to polish his English and that we seemed like nice people (at first he said “well-to-do”). We took a nap in our room and had dinner in the Maimonides restaurant outside the Mezquita. I had the Cordoban version of gazpacho, which was good as a dip; “mountain stew,” which was salty beef and kind of disgusting; and fruit. Mom got a chicken which was very plain and good, and ice cream. We walked around a little more, but when we passed the Cardenal the owner saw us and said that the show had been cancelled because there weren’t enough people. He gave us our money back and said he was sorry for us because we wouldn’t get to see it. We were disappointed, but I was glad I had already seen a flamenco show in Seville a few years ago. In the morning we walked towards the Plaza de las Tendillas, which is more modern and commercial. The area around our hotel is very touristy and has almost no grocery or clothing stores or anything practical like that. We found a café near a church which had a little better breakfast than the one from yesterday – but still only toast/croissant, orange juice and coffee. Plaza de las Tendillas is pretty and has a clock with flamenco guitar chimes. We actually saw an Italian restaurant here, which was the first non-Spanish restaurant we had seen. We tried to go back there later for dinner at around 8 pm, but it was closed! We later found out it didn’t reopen until 8:30 pm, though of course there was no sign on the door with the hours. We walked from the plaza to the Palacio de Viana, and on the way saw a lot of narrow winding streets and beautiful ecclesiastical buildings. A lot of the buildings here have an orange glow to them from the sandstone and are nicely weathered. There are a ton of convents and monasteries and medieval churches in this area. Everywhere you turn, there is another ancient building. I went inside San Miguel, where mass was again going on. All of the churches here have very lifelike, life-sized statues of saints or Christ and the Virgin. Luckily it was slightly overcast, so we were able to walk without getting overheated. 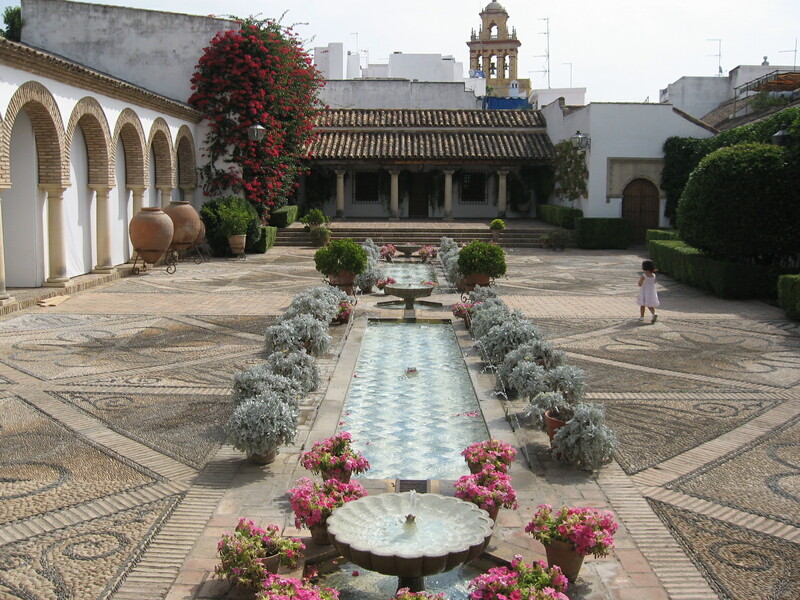 Eventually we reached Palacio de Viana, which has over a dozen beautiful patios with bougainvillea and fountains. We took a tour of the interior, which was only given in Spanish with minimal English translation. The house has a lot of beautiful, rustic Spanish furniture. I didn’t like the imported Italian and French and English furniture as much – it didn’t seem to fit. After this we walked back towards the Mezquita. We passed the Roman mausoleum, the ruins of a Roman temple (and the modern city hall right behind it), and the main plaza (which was kind of seedy). We went to the Museum of Fine Arts, which I was not too impressed with. At least one of the rooms was closed. We tried to have lunch before going to the museum. I thought there would be a lot of trendy places to eat near the museum, but I was wrong – just more tapas bars and restaurants. They’re all the same and look depressing. They offer either disgusting tapas or heavy, greasy meals for the middle of the day. I saw one tapas bar selling ox tail with chocolate! We walked around for a while and finally just decided to get some ice cream (strawberry and chocolate). At the Mezquita we got the audio guide. This time we had to pay to get in. The audio guide was very factual and not terribly exciting, but it’s good because it makes you stand in one place for a while and look around. Then we went back to the Plaza de las Tendillas to join a night walking tour we had booked at the tourist office yesterday (when I asked the guy whether we should buy tickets in advance because it gets filled up, he just kind of shrugged his shoulders). Since the Italian restaurant was closed, we ate in a café and got sandwiches with vegetables, egg, and ham and cheese. Their food is so unhealthy. They use huge slabs of white bread, never whole wheat, and everything is greasy and/or salty. The Spaniards themselves don’t seem to eat much. All they do is drink beer, and occasionally they’ll pop a few olives in their mouths. The tapas really just facilitate the drinking of beer. We also saw them eating a lot of ice cream. I think one reason their food is so bad is because they didn’t have much immigration. There’s almost no variety here, and the restaurants are closed at such inconvenient times. We were also shocked by how many people were smoking. Very few people here are overweight, probably because they eat so little and smoke so much. It would make a huge difference in the tourist experience if the restaurants had more variety and better hours. There are a lot of restaurants in Cordoba, they just all sell the exact same things. There were a decent number of people on the tour and most of them were English speakers. One of them was a woman from California who was doing a house and car-swap with a family from Madrid. She was there with her husband and daughter. The tour was pretty good, though it covered a lot of the ground we had already seen. We saw the very narrow streets of the Calle de las Flores and el Panuelo, which had the smallest plaza I’ve ever seen. We made a stop at an inn in the Plaza del Poltro, which was the basis for one of the inns in Don Quixote, where there was an actor dressed as Seneca who made a speech in Spanish. We also made a stop at the Chapel of Saint Bartholomew, which is tiny but very beautiful. At this stop, the same actor made a speech dressed as Maimonides. After the tour, the tour guide took us to a tapas bar where we could get a tapas and a drink. I got chorizo, which was disgusting, and water. The woman from California mentioned that she had had very good paella for lunch, but that it’s reheated for dinner. I can’t eat anything that heavy for lunch, especially when it’s over 100 degrees out. I asked the lady at the front desk to book us on a tour to Medina Azahara for the day, but she said it was already filled up. This was surprising because things seemed pretty slow around there. So we had to buy bus tickets from the tourist office. We had breakfast in the hotel lobby. It was better than we expected; they had croissants, toast, orange juice, coffee, ham and cheese (which we didn’t get), fruit, and yogurt. Afterwards we walked to the bus. I stopped in the church of St. Nicholas, which had some very interesting statues of Christ and Mary. The bus picked us up outside the Roman mausoleum and dropped us off near the museum. We watched a short film on the site, which had very good computer-generated reconstructions. Then we took another bus to the site itself, which was fascinating. 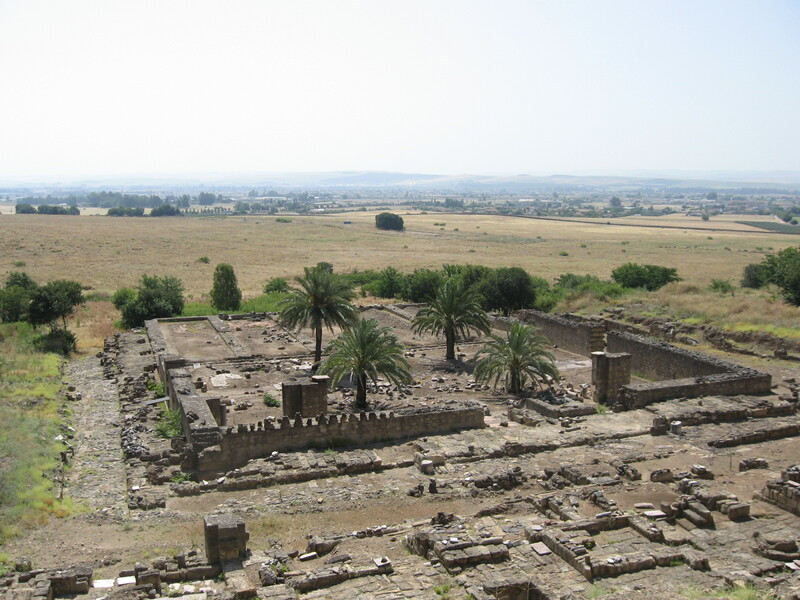 I’ve never seen a Muslim archaeological site. Unfortunately the main hall was closed for renovation or excavation. It was incredibly hot standing out there in the sun, so we went through the site as quickly as we could. I was the only person carrying an umbrella for shade. There were only one or two places where painted decoration was still visible. I also saw a well-preserved brick oven. There was a lot of nice vegetal decoration on the walls, though much of it is still on the ground being pieced together. We took the bus back to the museum and ate pineapple and a pizza at the café. Almost everyone else was drinking beer. We had to go through the museum very quickly to make the bus back to Cordoba, but it seemed excellent, with many more computer-generated videos and artifacts. It would be nice if reproductions of the artifacts were placed in the site itself. I would have liked a half hour more at the museum, but the bus was leaving. Note: Cordoba is full of swallows and white or near-white pigeons. When we got back to Cordoba we took a nap, then went out for a walk around the Alcazar and Royal Stables. It was still siesta time (which lasts from around 2 to 8:30!) and the streets were almost deserted. I don’t know what they do for so long. It seemed very inconvenient to us. There are some lovely patios here, which you can see through the gates. The city walls are also quite impressive. I saw the old Moorish water mill on the Guadilquivir, but they were doing construction work in front of it. We went into the royal stables and saw them exercising the horses. We had tickets for the 9 pm equestrian show. We thought we would have dinner at Casa Mazal before the show, but we found out they don’t open until 8:15, which wouldn’t leave us enough time. So we actually went to the Burger King outside the Mezquita. We didn’t want to go, but we felt we had no choice! We got Whoppers and a salad, and it was the best meal we had in Spain! The show at the Royal Stables was very enjoyable. We were seated on a few benches on one end of a stone building, and the horses came out one by one or in pairs and did dressage and tricks for us. The riders wore traditional outfits. 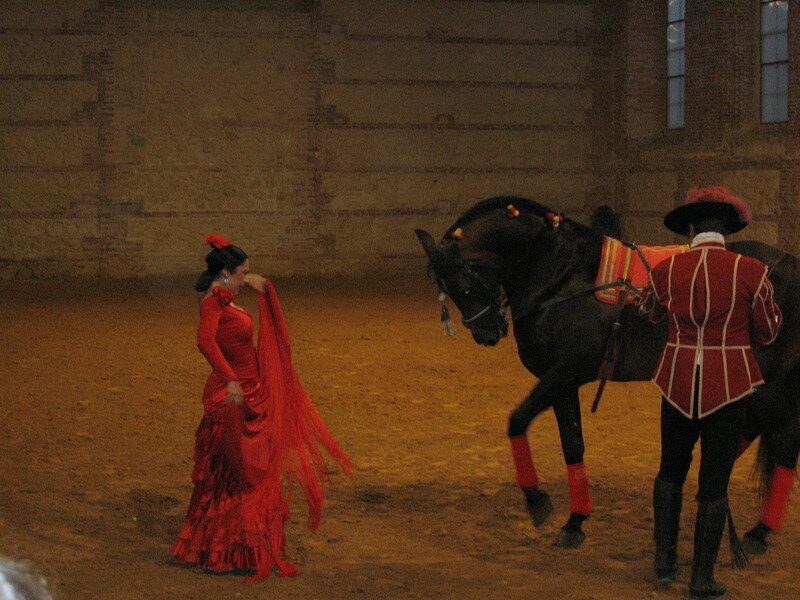 For two parts, a flamenco dancer came out and danced with the horse. Kind of corny, but it was nice to watch. They introduced the horses in Spanish and played music on the loudspeakers. The show might have been cut short because they had a huge dinner party coming into the stables, as we saw when we were leaving. They had two horses with riders standing at the entrance. The next day we ate breakfast at the hotel and walked to the train station. It’s cool in the morning so it wasn’t too hard to walk; it took about half an hour. We got tickets but they didn’t have any seats until 11:30 am, about 2 hours away. Again, I was surprised by this, since things seemed pretty slow. I also realized that with our ticket stubs from Madrid to Cordoba, we could get a 20% discount on the return tickets. However, I didn’t find this out till after I had bought the return tickets, so I had to go back and get a refund. I had to do all of this in Spanish, since they didn’t speak much English. 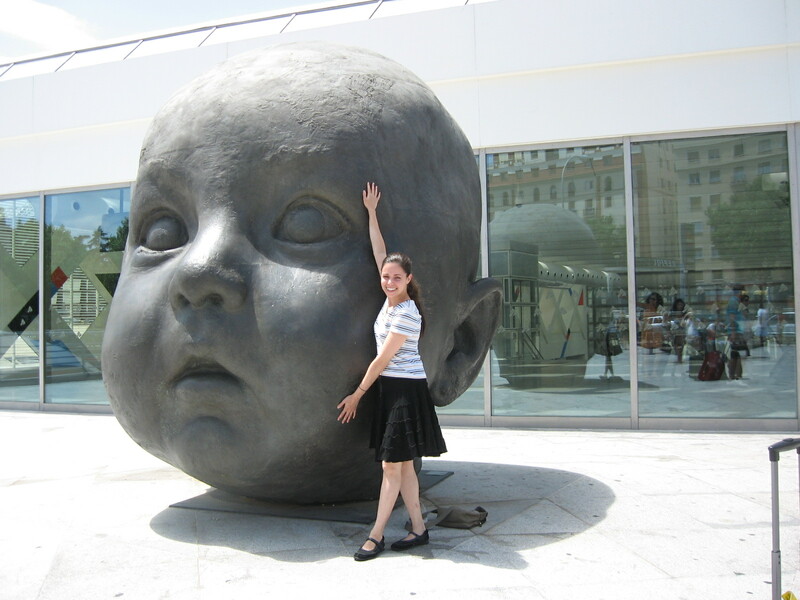 Outside Atocha station there were some huge bronze baby heads (by Antonio Lopez?). We walked to our hotel, the AC Carlton, which was a few blocks away from the station. Madrid is a little grungy and much dirtier than Cordoba, where they whitewash their houses all the time. The hotel was pretty modern and comfortable, though the bathroom smelled a little. It had a mini fridge and computers in the lobby. There’s a lot more food variety in Madrid. They have Mediterranean food, Italian food, lots of Burger Kings and McDonald’s, and even Starbucks and Dunkin’ Donuts. Normally I don’t like to see chains, but they were a welcome sight to us in Spain. We went to a Starbucks outside of the Reina Sofia museum and had a yogurt parfait, a cookie and a pasta dish. Then we walked to the Thyssen-Bornemisza museum, which has an excellent collection. I love their pre-modern stuff. They also had an Antonio Lopez exhibit that was sold out. After this we went to the CaixaForum, which hadn’t existed last time I was in Madrid. However they only had an exhibit on Russian avant-guard art, which I had no interest in seeing. I did get a peacock note-holder from the gift shop, however. At this point everything was closed, so we just walked around. I basically retraced the steps I had taken the last time I was in Madrid. It stays light in Spain until almost 10 o’clock this time of year, which is great for sightseeing. The weather was also much cooler than we had had in Cordoba. We walked around the Prado, then went up to the Puerta del Sol which neither of us liked. It’s extremely crowded and full of freak shows. Then we walked to the Plaza Mayor. Madrid is a lively place, but I don’t like these large public areas too much. We walked back to the area where we had seen a few Italian restaurants and had pizza in a small pizza parlor. It was fresh and smelled good, but the cheese was very salty. When I went through security again one of the guards (in Spanish) looked at my plastic bag of 3-oz. toiletries and said, “This is a really big bag.” I started complaining that I always traveled like this and never had a problem, so he let me through. Made the huge walk back to Terminal A, went through security there again. I made sure I was listed for both the US Airways flight (to Philly) and the Continental flight (to Newark). The US Airways gate agent said it didn’t look good, but the Continental agent said don’t worry, you’ll get on. The US Airways flight left a little earlier, so I kept going back and forth (the gates were next to each other, though they were very far apart) until I got my Continental ticket. I don’t think they ever called me for the US Airways flight. The flight back was uneventful. There was even an empty seat next to me. I watched the 2011 version of Jane Eyre, which was excellent, and The Informant!. I was so stressed out from the airport experience. I should have known that the loads weren’t good enough and made alternate plans, or something. The Madrid Barajas airport is also the worst airport I’ve ever seen. It’s clean and modern, but the layout is terrible, the workers are rude and don’t speak English, the signage is bad, and it’s a complete nightmare if you’re trying to do anything out of the ordinary. In conclusion, Spain is a beautiful country, but they need to improve their food situation!